One of my favorite films growing up was a Walt Disney Productions 1976 Movie titled "Gus" which was about a mule placekicker that made long field goals. For Gus, making 50-plus yard field goals was the norm. The Detroit Lions have a field goal kicker that kicks field goals a long way and for him 50-yard field goals come often. Like QB Matt Stafford, Matt Prater is shattering Lions records at a brisk pace. On October 25, 2017, Detroit signed Prater to a 3-year extension worth as much as $12.15 Million that includes potential incentives. Prater has hit from 50 yards 20 times since joining the Lions. He has three 55-yarders this year which is an NFL single season record. Of the seven longest field goals in Lions history, Prater owns five of them while Jason Hanson has a pair. Prater owns the Lions four longest field goals at 59, 58, 58, 57 and 56. Hanson also has two 56-yard field goals. Prater joined the Lions in 2014 and against the Pittsburgh Steelers on Sunday Night, October 29, 2017, his leg amounted to the only points scored as Detroit lost 20-15. He could have had six field goals, but Detroit elected to go for a touchdown and failed to convert deep in the red zone on fourth down. As a result, Pittsburgh drove on the next possession and scored for what proved to be the game winning touchdown. Now the Lions have Prater until 2020 and I'll be curious to see how many more game winning field goals he amasses before his career is concluded whether they're long or short. Meanwhile, it's worth noting that on December 8, 2013, Prater set an NFL Record with a 64-yard field goal as he led the Denver Broncos to a 51-28 home win over the Tennessee Titans at Mile High Stadium which has an elevation of 5,280 feet above sea level. The Michigan Wolverines are on their third QB this season, but that signal caller isn't named Shane Morris. Morris, 23, a 6-3, 225 pound native from Warren, MI, is making a name for himself at Central Michigan University (CMU). He threw three TD's in CMU's 42-30 win over Eastern Michigan Wednesday Night in Mount Pleasant as his squad improved to 6-4. Central Michigan became bowl eligible for the 10th time in 12 years. Morris has played in 10 games and has thrown for 2,364 yards, 21 TD's and 11 interceptions. If the senior QB keeps winning games, there is always a good chance that he'll have an opportunity to play on Sundays if he impresses scouts in preparation for the 2018 NFL Draft and attempts to become a hidden gem. The Florida State Seminoles rescheduled a football game that I thought would never happen, but when a team is desperate to play in a bowl, then you play it. Early this fall, Hurricane Irma forced the cancellation of many football games in Florida. On September 9, 2017, Florida State was supposed to host The University of Louisiana-Monroe. At that time, no make-up game was scheduled. Now the game is scheduled for December 2, 2017, in Tallahassee, FL. FSU is currently 3-5 and is off to its worst start since 1976 and may need this game to be bowl eligible. The Seminoles have not missed a bowl game since 1981. Louisiana-Monroe is also 3-5 but win or lose, at least they'll get a guaranteed payday. These guarantee games which enable smaller schools to finance their athletic departments, start out as low as $500,000 and exceed millions of dollars depending on the opponent, plus factoring in travel expenses. In many instances, these games are mismatches for the smaller programs, but are helpful to the larger schools as they prepare for their demanding conference schedules. But, who would have imagined Florida State being in this predicament especially since the Seminoles defeated the Michigan Wolverines in The Orange Bowl 33-32 on December 30, 2016 at Joe Robbie Stadium. 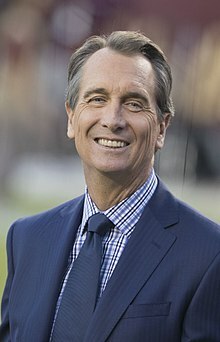 Finally, during the Thursday Night Football Game between The Seattle Seahawks vs Arizona Cardinals, NBC Color Analyst Cris Collinsworth, photo on right, made a very interesting observation as we head into Veterans Day Weekend. Collinsworth, a former Florida Gators wide receiver, said that former Arizona Cardinals Safety Pat Tillman belongs in The Pro Football Hall Of Fame. I strongly agree with Collinsworth! Following the September 11, 2001 attacks, Tillman's 15 game salary was $512,000. In May of 2002, eight months after the September 11 attacks, Tillman, who played three years with the Cardinals from 1998-2001, turned down a contract offer of $3.6 Million over three years from the Cardinals to enlist in the U.S. Army which pays approximately $25,000 annually. Tillman was killed on April 22, 2004 and was 27-years old. After his death, Cardinals Owner Michael Bidwell honored Tillman in many ways. The Cardinals retired his No. 40. Tillman is in The Cardinals Ring of Honor. Tillman has a locker at the Cardinals Practice Facility. The Cardinals named the plaza surrounding their University of Phoenix Stadium in Glendale, AZ, The Pat Tillman Freedom Plaza. Tillman has a bronze statue. Up to this point, I've been very quiet about my views on the National Anthem Protests. I'll keep my comments short and sweet. Having had close family and friends serve in the military, I strongly believe that Standing For The National Anthem is The Right Thing To Do! There are other ways to protest, but kneeling for the National Anthem isn't one of them. Throughout my years of covering the NFL, I've been fortunate and feel privileged to have written about contests that are played on Veterans Day, December 7 (Pearl Harbor) and September 11. There is nothing more uplifting than being in the Press Box seeing the Flag covering the field. This weekend, we'll be in Jacksonville as the upstart Jaguars host the Los Angeles Chargers. You can rest assure that my I-Phone will be taking photos of the Flag at EverBank Field. I will never boycott the NFL because as a professional in Sports Media, it's my responsibility to inform and provide objective commentary to all of my followers. This philosophy applies to all the sports that I cover. I've been covering sports for 38 years and I know there are many people that would love to trade places with me thus, I don't take anything for granted. The only way that you last in this industry for along time is to be ethical, accurate with your information, be fair and demonstrate integrity with how you go about delivering your message. But getting back to Collinsworth and Tillman. Tillman does belong in The Pro Football Hall of Fame and Collinsworth hit a bulls eye with these comments! Tillman's numbers on the field due to his short playing career should be an after thought, and doing the right thing is paramount.